The University of Montana ran a bi-partisan poll back in June that indicated very strong support for protecting public lands, including the Badger-Two Medicine region . . .
A University of Montana poll done last month found there’s strong support for national monument status for the Badger Two Medicine region near Glacier National Park. The Badger-Two Medicine is a 130,000-acre wildland south of Marias Pass on the Lewis and Clark National Forest. 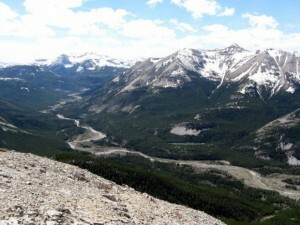 It is known for its elk herd and is prime grizzly bear habitat. The Blackfeet Tribe consider the ground sacred. It’s also been embroiled in controversy for decades, as oil and gas companies have sought to drill for oil and gas there. Currently, there’s a lawsuit in federal court over the matter, as the Obama Administration canceled all the existing leases in the area during the waning days of the administration, paying off the companies in the process. The UM poll found that 76 percent of voters supported a national monument designation for the Badger-Two Med.